South of the Border-One of America’s Kitchiest!! A new article rates South of the Border in Dillon, SC as one of the Top Ten Kitschiest Roadside Attracitons in America. We are often called “America’s #1 Roadside Attraction” and we are very pleased to see that a few travel writers are beginning to agree with what millions of East Coast tourists have known for years That South of the Border is one of them most fun diversions along your travels of any attraction in the U.S.
Travel and Leisure Magazine’s list of the Kitschiest Roadside Attraction has South of the Border comig in at #8. This article says “If the Three Amigos had their own theme park, it might resemble South of the Border.” and that sounds like a good description to us. Thanks to writer Jessica Su and all at the magazine. SOuuth of the Border welcomes you all back anytime, along with our millions of other faithful visitors. This entry was posted on Wednesday, August 31st, 2011 at 5:48 pm	and is filed under Press. You can follow any responses to this entry through the RSS 2.0 feed. You can leave a response, or trackback from your own site. I LOVE south of the border! Its been a few years and I really need to go again! Travel and Leisure is correct – you have to stop there! In a flash of extreme nostalgia I typed “South of the Border – Carolina – Highway” in a search engine hoping that you would still be around… and lo and behold: you are still there! I have very happy memories from your place, it was an “oasis” indeed. Kids just LOVE kitch. I must have been around four, when my parents stopped for the first time at “South of the Border” ca. 1961. Pecan rolls, funny ouvenirs, postcards, baskets full of colorful cheap toys and gadgets (I still regret that plastic back-scratcher my mom didn’t want to buy me). My dad used to frequently tour the Southern states to promote French tourist destinations in the local media in the 1960s and always took the family with him in the station-wagon. When we saw “South of the Border” appear on the left-hand side, going South, it was always to us like the gateway to our dear South Carolina and the rest of the states of the deep South. Stopping there again, on the return trip, was a consolation as we were sadly on our way back North. It was a joy to see that the place was still standing, unchanged in 1977, when I returned as a young adult. I hope to stop over and visit, once again, some time soon. (PS: why can’t you find such delicious tasting pecan rolls in the South any more? Are they made in China now, that they taste so differently? I hope you still have some good ol’ old fashion-tastin’ ones left, like before). We lived in Georgia from 1962 until 1970 and traveled to New Jersey several times. I never remember seeing South Of the Border on our travels. Our four little Girls would probably have gotten a kick out of the place. You realize that’s a backhanded compliment, since the term “kitsch” means tasteless and tacky. People who refer to SOB as kitschy are usually snobs with no sense of humor. Personally, I think SOB is awesome, a one of a kind piece of American culture. We are pretty sure the article is all in good fun, and Pedro has been all about fun for over 60 years. Thanks for stopping by our website and we hope you can visit us i person soon! I have been heading south on Route 95 since the middle ’60’s. I have developed a personal relationship with Pedro. As we past through NC, we are on the look out for the first sign about South of the Border. From that point on our family discusses whether we have the time to stop. As we approach the SC border, i look up and see Pedro on his tower. He waving his hands, and jumping up and down, “come on, Stuart, stop. So we stop. There is so much to see and do. We always buy some gifts for the children, and kids of relatives. 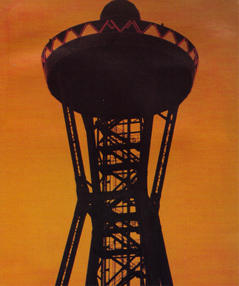 South of the Border is a landmark that deserves special recognition. It breaks up an other wise boring drive into three parts: 1. Anticipation.two hours, and finally getting there. 2. Getting there and enjoying. 3. Talking about being there, what we did and what we purchased… for the next two hours. 4. Getting to our destination, Hilton Head, SC, in no time flat. Trip never seems to take very long, with Pedro in our lives. If you talk with anyone who lives on the East Coast, that travels Rt. 95′ and just mention Pedro. Watch a smile break out..whether you are old or young. 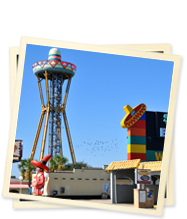 I have fond memories of visiting South of the Border with my parents and sisters over the years and have taken my grands to see Pedro and visit the “hat”…they love it!! Some of my family from Maryland are having a blast there now as I write this!! :)…One thing that wasn’t mentioned in the history of SOB were the animals!! I remember the buffalo or bison and giraffe that roamed the area! South of the Border is one of the very few remaining vacation stops from the early days. Hopefully it will remain and be preserved because in about 100 years this will become a historic landmark that many will travel to see. We all need to look at this as one of the last original frontiers in a world of chain restaurants, hotels, and shopping. I am so tired of traveling around the country and walking through shopping villages and tour stops that all look the same, that I am more than willing to stop here and spend my money to show support. Now if only all those classy old roadside hotels would be rediscovered and cleaned up for business! Like Alan Kobtzeff, I find myself on the internet looking to see if South of the Border still exists. In the fall my family will be taking a trip to Colonial Williamsburg and I so dearly want to stop at South of the Border along the way and say “hi” to Pedro. We were there in the early 80’s when my kids were young. My daughter and son-in-law will be joining us and she is so excited that we will be stopping at Pedro’s place along the way. Thanks for some good memories and hopefully new ones as well. Thanks Will, come visit with Pedro again soon!